View this sample resume for an attorney, or download the attorney resume template in Word. Your resume needs to be a convincing argument in favor of your skills and experience. To be considered for top attorney jobs, resume expert Kim Isaacs says it helps to have a comprehensive resume. 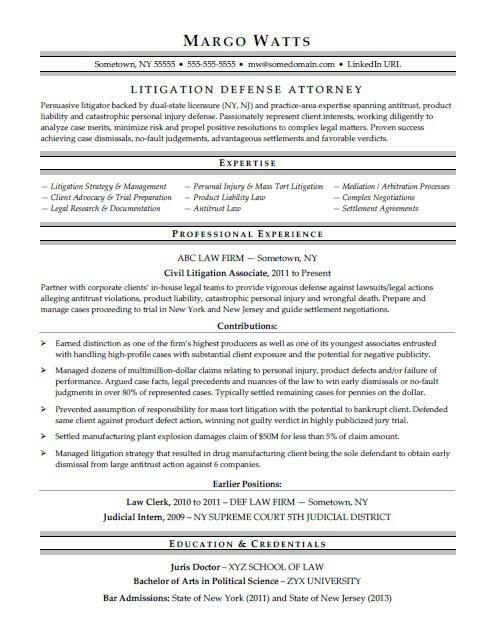 For resume writing tips, view this sample resume for an attorney that Isaacs created below, or download the attorney resume template in Word. And if you need more help, get a free resume evaluation today from the experts at Monster's Resume Writing Service. Jobs for attorneys are projected to grow by 8% (or 65,000 jobs) from 2016 through 2026, according to the Bureau of Labor Statistics (BLS). You'll find the highest level of employment for this job in the following states: California, New York, Florida, Texas, and the District of Columbia; and in the following metropolitan areas: New York City, Washington D.C., Los Angeles, Chicago, and Atlanta. As an attorney, you can expect to earn a median wage of $119,250 per year, or $57.33 per hour, according to the BLS. Additionally, you can search for attorney jobs on Monster. Persuasive litigator backed by dual-state licensure (NY, NJ) and practice-area expertise spanning antitrust, product liability and catastrophic personal injury defense. Passionately represent client interests, working diligently to analyze case merits, minimize risk and propel positive resolutions to complex legal matters. Proven success achieving case dismissals, no-fault judgements, advantageous settlements and favorable verdicts. Partner with corporate clients’ in-house legal teams to provide vigorous defense against lawsuits/legal actions alleging antitrust violations, product liability, catastrophic personal injury and wrongful death. Prepare and manage cases proceeding to trial in New York and New Jersey and guide settlement negotiations. Earned distinction as one of the firm’s highest producers as well as one of its youngest associates entrusted with handling high-profile cases with substantial client exposure and the potential for negative publicity. Managed dozens of multimillion-dollar claims relating to personal injury, product defects and/or failure of performance. Argued case facts, legal precedents and nuances of the law to win early dismissals or no-fault judgments in over 80% of represented cases. Typically settled remaining cases for pennies on the dollar. Prevented assumption of responsibility for mass tort litigation with the potential to bankrupt client. Defended same client against product defect action, winning not guilty verdict in highly publicized jury trial. Settled manufacturing plant explosion damages claim of $50M for less than 5% of claim amount. Managed litigation strategy that resulted in drug manufacturing client being the sole defendant to obtain early dismissal from large antitrust action against 6 companies.